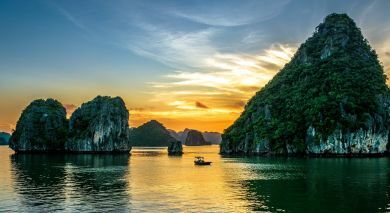 Take a glorious and relaxing trip into the awe-inspiring Halong Bay aboard the Glory Legend Junk. The traditional Vietnamese junk has14 elegant yet cozily furnished rooms equipped with large private bathrooms, work stations, temperature control and a separate balcony or terrace. The spacious sundeck offers great views of the stunning scenery as the ship slowly cruises past the UNESCO World Heritage Site. The ship offers WIFI, large dining rooms and bars, a business center, smoking areas, and a car park. The junk is perfect if you wish to indulge in a wide variety of watersports or spend a relaxing day at the spa on board.